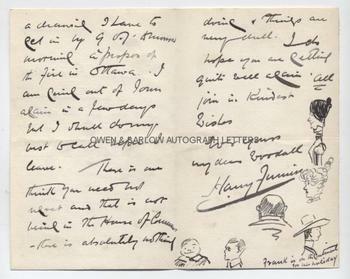 HARRY FURNISS autograph Letter Signed with drawings. ALS. 3pp. 23 St Edmund's Terrace, Regent's Park, N.W. Sunday, 30th April 1900. To [William] Woodall. Together with a fine portrait photograph. "I intended running up to see you this afternoon if only for 5 minutes just to see how well you were looking but unfortunately I have had to break the "Sabbath" most sadly by working at high pressure on a drawing I have to get in by 9 o'clock tomorrow morning a propos of the fire in Ottawa. I am going out of town again in a few days but I shall do my best to call before I leave. There is one thing you need not regret and that is not being in the House of Commons - there is absolutely nothing doing and things are very dull. I do hope you are getting quite well again. All join in kindest wishes." 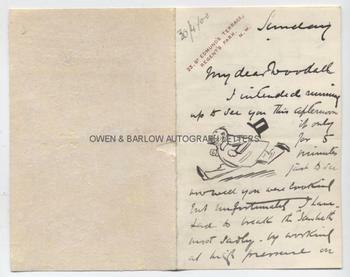 The letter is illustrated on the first page by a pen and ink drawing of Harry Furniss running with his top hat blowing away and on the last page with small drawings of heads, one of which bears the caption 'Frank is on the Continent for his holiday', and is probably intended to represent the artist Frank Topham, a mutual friend. 12mo. Approx 6 x 4 inches. Mounting residue to the blank verso of last leaf else fine. 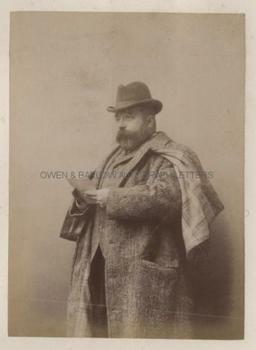 The portrait of Harry Furniss is a fine albumin silver print photograph measuring approx 5.5 x 4 inches (excluding mount). It shows Harry Furniss half-length in tweed greatcoat and hat, with a paper in his hand, possibly in the act of sketching. It is laid down on card from an album leaf. 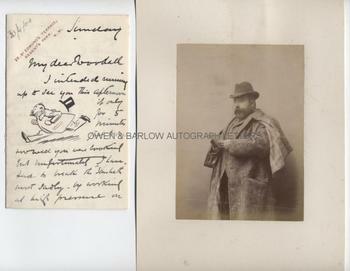 Mounting damage to verso of card but the photograph is in fine condition. Harry Furniss was one of the best loved of Victorian illustrators. His work appeared in the Illustrated London News, the Graphic and Punch. He was also a noted book illustrator, including works by Lewis Carroll and others. His caricatures of politicians were one of his specialities and he was often to be found in the gallery of the House of Commons, sketchbook in hand. He was a close friend of the radical Liberal M.P. William Woodall and his autobiography 'Harry Furniss At Home' (1904) speaks warmly of their friendship. William Woodall fell ill and was obliged to give up his seat in Parliament in 1900. He died in Llandudno the following year. Both the letter and the photograph are from a 19th century collection made by William Woodall.